Some people might walk into a baseball stadium and feel completely at home. 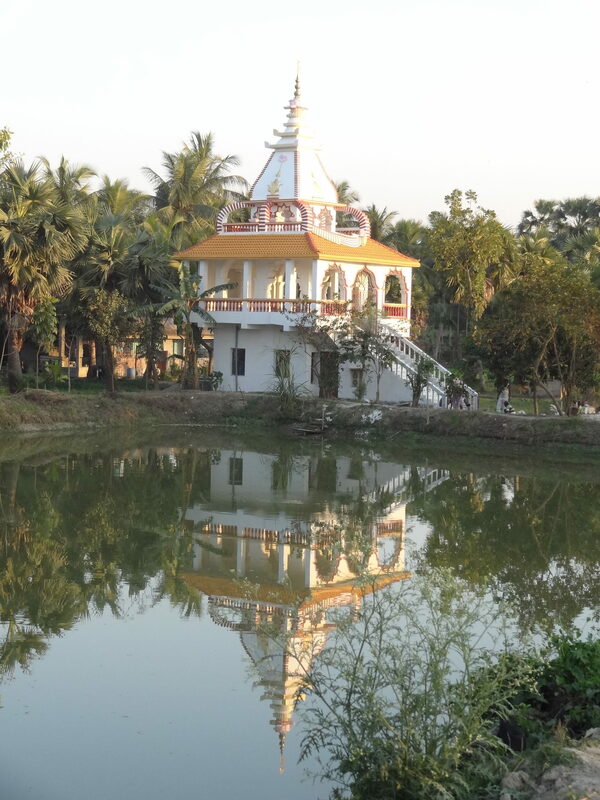 I drive up to the big white gate of the Yogoda Satsanga Society ashram just outside of Kolkata, India; and it feels as familiar as my kitchen. Dakshineswar ashram is five acres of overhanging trees and gardens that face the Ganges River. There are basically four buildings; an office that also includes a temple, a dormitory for retreatants, the kitchen/dining building and housing for the monks which is off limits to visitors. 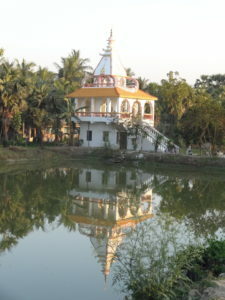 The temple faces the river. 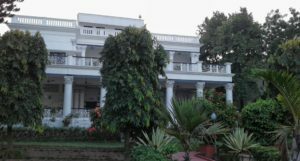 Across the front is a large portico with marble tiles that remind me of a grand porch across an old Southern mansion. The pillars start out as classic Greek columns and then explode into ornate Indian carvings at the top. Birds that make a “whoopa whoopa” sound and crows dart from tree to tree. You can occasionally hear faint sound of voices on the ferry putt putting across the river. The temple has vibrations that I could never find words to express. What a pleasant surprise! 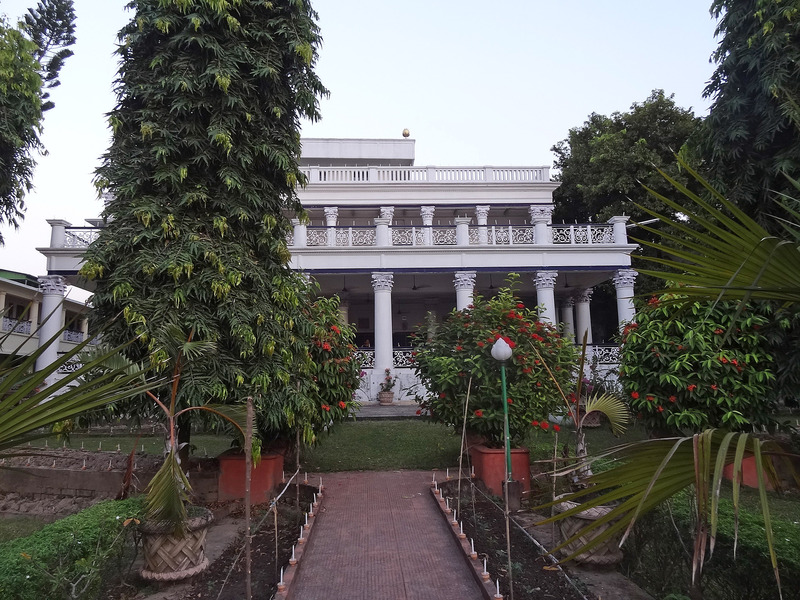 We arrived at the Dakshineswar ashram just days before Brother Chidananda’s visit. Nice coincidence? He is the new president of Yogoda Satsanga Society of India and the American counterpart, Self Realization Fellowship. Both of the recent presidents have been quite aged so neither had visited India in a very long time. Elected only last August after the passing of Sri Sri Mirnalini Mata, Chidananda knew immediately that his first duty was to go to India for their 100th anniversary. The days before his visit we all felt swept up in the excitement. Ashram employees and volunteers were painting, cleaning, scrubbing, and arranging. Even my favorite security guard with the balloon cheeks beamed with happiness as he went about his extra chores. My friend, the kitchen manager, thought since it was a weekday, perhaps only 200 extra visitors would come, but the next morning they were planning for 500. 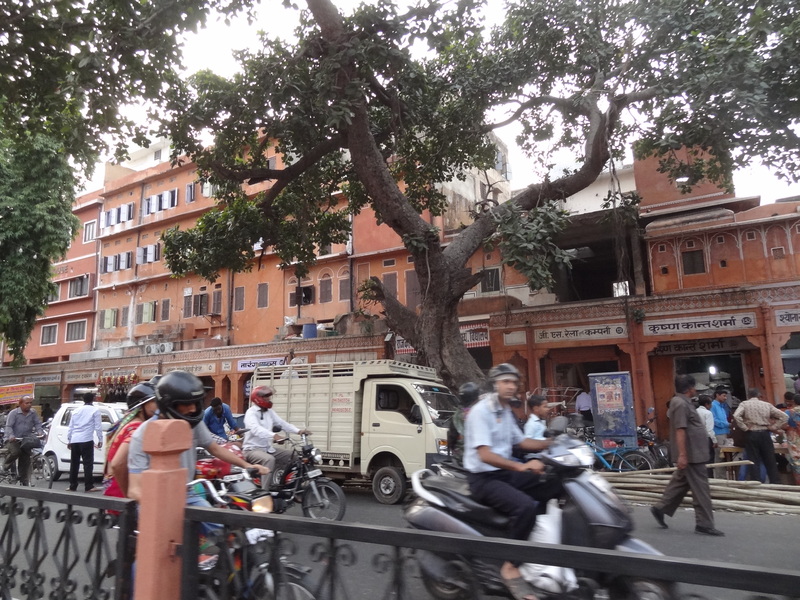 The streets in Dakshineswar are one lane rat mazes–hard to imagine people finding parking or even a way to get there. There are folks here from all over the world—a German group, two Swedish girls, New Zealanders, and a larger group from Argentina. Within hours a stage was erected in the gardens, a sitting area set up for serving dinner, audio system tested and re-tested, and chairs carefully lined up. Flowers and banners everywhere possible. Finally after much Indian ceremonial officiousness, Brother Chidananda took the microphone carrying us away on his commitment to a vision for the future, his humility and love of the guru. During his speech, my mind wandered to the political drama unfolding in America, and I barely could believe my good fortune to be here instead of there. It felt like a dream. There are many pseudo spiritual teachers, especially in California, but when a person has gone through the training of going within until he/she conquers their own darkness of the mind, there is a magnetism that’s difficult to talk about but is as real as the mosquito bites on my arm. One feels filled with, what to call it, sweetness, love. These are only words that can barely describe my overflowing heart. He gave prosad (a small gift) individually to every person present, holding our hands for a few seconds. Being in his presence continues to motivate David and I to work harder. 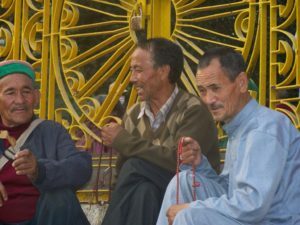 Between the funky internet connections and computer glitches, I have not been diligent with my blog communications from India. Now we are settled for our last few days in Kerala. We have been traveling with wonderful friends, but it is nice to be on our own again. It’s hot. Humidity in Kerala must be 50-60%. 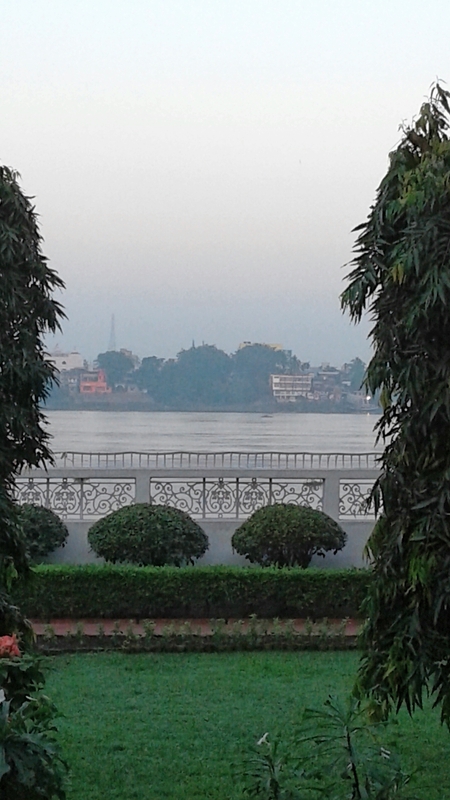 The river in front of our place is mesmerizing. It moves slowww and so are we. The much welcome pool is blue and white check tiles, and I swear I can smell cinnamon on the breeze. It’s noon the Muslim callers are singing (moaning) again. David calls them the Muzzies. 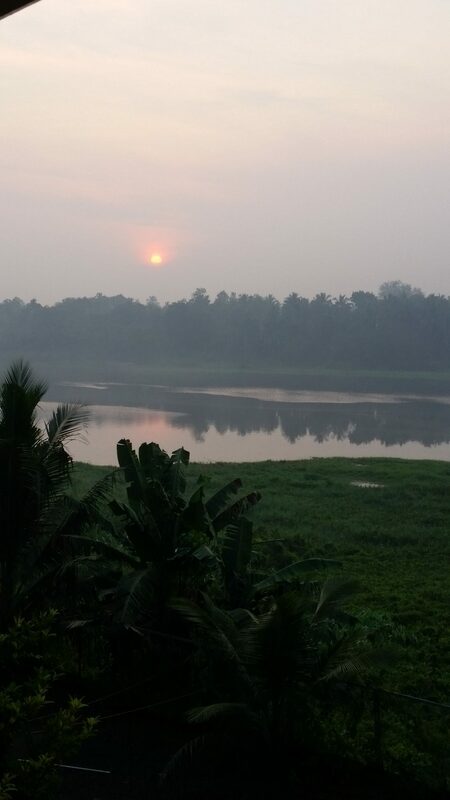 We wake each morning to frolicking, playful South Indian music that comes from across the river. The birds in this quiet valley along the river are incredible. I would give my left elbow and one toe for a pair of binoculars and bird book. Thought we might take a backwater boat trip today, but at 2 AM we decided to cancel. It would have been 3 hours in smoggy traffic to get there. Just don’t want to do that again. We took a walk late this afternoon in hopes of finding a cup of tea. I doubt many Westerners stay in this resort on the fringe of town. We’re quite a phenomenon. Always wanted to be the center of attention (in high school). The women scowl at us and the men just stare. But if I put my hands together, pronam and bow slightly, grins spread across their faces. One toddler saw us passing and sang out in his best English, “Bah bah black sheep have you any wool.” I responded with, “Yes sir, yes sir, . . . . “ And he didn’t quit for blocks. We passed a butcher shop—four bamboo poles holding up a plywood roof. 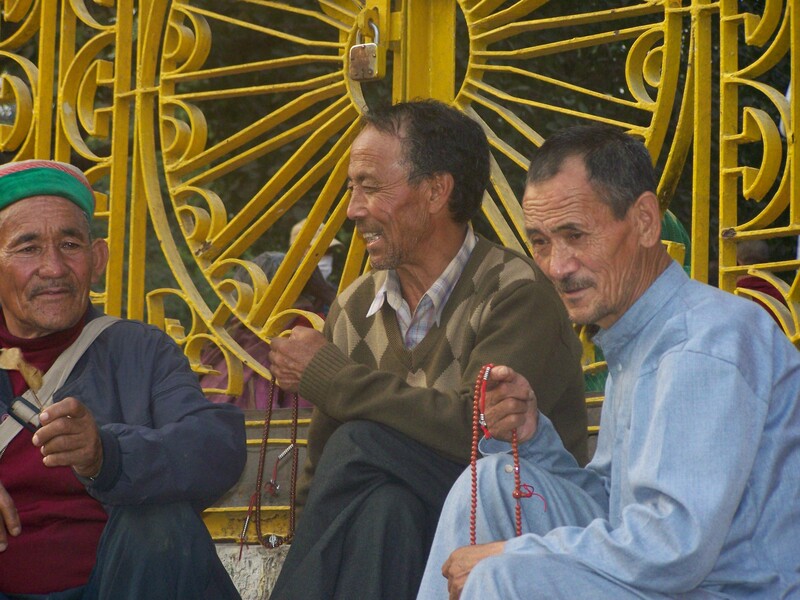 Three or four men just gabbing with each other and cutting up meat. A side of beef or goat hanging street side. This neighborhood is made up of middle class looking houses. Some use rocks, tile or even marble for their front yards. Others are surrounded by encroaching jungle. 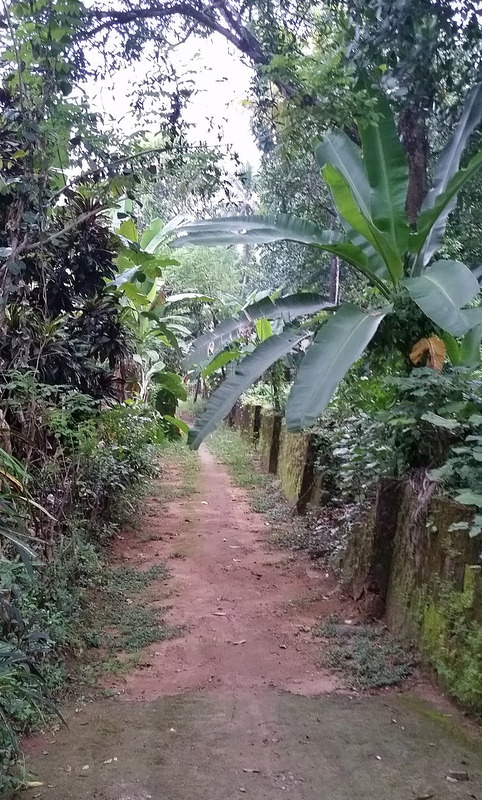 Walking down an enticing trail, we found the homes of the poorer peoples. (Don’t worry, it’s quite safe here.) 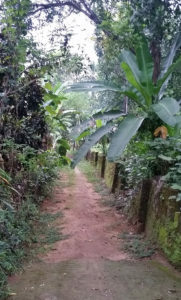 A couple acres of banana, papaya, or rubber trees surround the bigger estates on the river side of the road. Have you ever been in a situation where all your emotions fire off in the same moment? A little intimidation, compassion, confusion, embarrassment and even disgust. We stepped into a tea shop. This bone thin creature nearly leaped out of her chair at the excitement of seeing us. She had maybe two buck teeth left, and one eye crossed. She was more wrinkled than a linen dress on a hot day. Alert but most likely demented. She waved her scythe at us when she talked (though we didn’t have clue what she was saying). Earlier that day I had seen other older folks with scythes cutting back brush in the front of the bigger estates. There was a schmaltzy, Bollywood musical on the TV above our heads. David and I started waving our arms and swaying in our seats which made her even more excited. When the owner, who was quite tolerant and protective of her, walked back into another room presumably to make more tea, she got out of her seat and stood in front of our table. With her mouth wide open and full of crackers/biscuits, she pantomimed how she needed more food or help. David just pantomimed right back. He dug into his pocket for something to give her. When the owner returned, she acted as if she knew nothing about this money that was on the table obviously for her. I’m sure he wouldn’t approve of her begging in his shop. The energy got a little strained. We finished our tea, smiled, bowed to everyone, and continued our walk. PS Another friend I met along the road. jTTHESE ARE h from around the ashram Gary a. We all have pre conceived expectations misunderstandings of any new place or experience. I admit to a certain amt of fear of arriving in Kolkata, India at 1 AM. Purse well zipped, money under my shirt. The reality was/is much different. One has to smile at the need to have 5 young men sitting at the official taxi booth in a fairly empty airport this late. I question their price to take us to Dakshineswar, a suburb that’s barely a 15 minute drive, when a well-dressed business man steps up to be our advocate. After much haggling, questioning, negotiating an discussing (none of which we can understand), he assures David and I that we will do better somewhere else. He walks us to the next business, we discuss where we are going, look at google map. Another four young men sit munching their snack as “the boss” writes us a ticket on a piece of paper smaller than a 3×5 card. Ten minutes later he says, “Little more patience, madam”. I look over the counter and make a motion of putting a little of their food in my mouth. The guys look confused and then David pretends he might take a nap on the counter. They all flash those radiant Indian smiles. 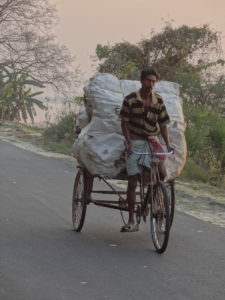 Finally “the boss man” takes us out to the road where taxi is waiting – more discussing and negotiating while luggage is loaded into a beat up Toyota with a trunk that doesn’t close properly. We cheer and finally leave the airport. This is India! I had forgotten that in India everyone is overly helpful, full of advice, eager to please, and proud of their integrity. For the most part, quite charming. Different from most of the world’s expectatios. The real danger is losing one’s patience and sense of humor. We wake the next morning to the swish swishing sounds of sweeping fallen leaves from the walkways of the ashram. 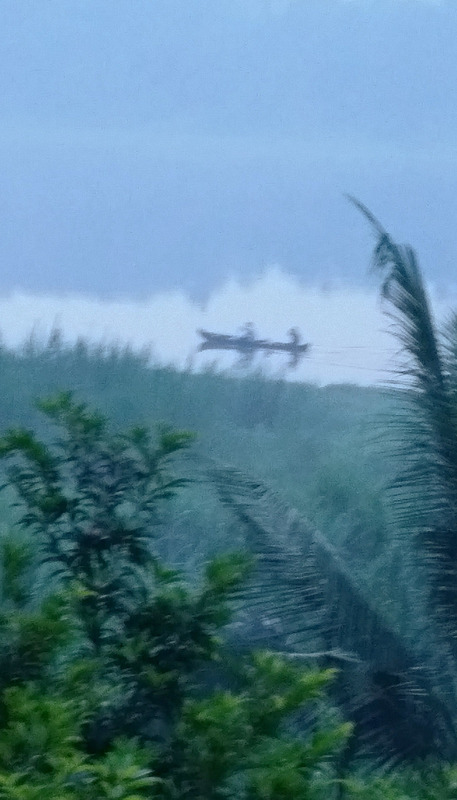 Mist hangs over the Ganges. Retreatants gather on the portico for morning exercises as a bevy of birds dart in the trees overhead. The ferry putt putts across the river carrying people to work leaving a scent of propane in its wake. The noise, pollution, and busyness of India is outside, this is the eye of the hurricane. Somehow I stand taller here, do my exercises with more intention. There’s more air in my cells, more lightness in my mind. And my heart is filling up and spilling over. David and I feel like this is our home away from home. Hello All; We have arrived and are settling in. Last night I was able to sleep until about 2:30, and then was awake the rest of the night. There were 3 nights in a row when we didn’t sleep before leaving so body can’t yet figure out if it’s night or day. Yesterday was Sunday. David and I slept after service. Ashram has grown so much –people sitting out along the building on nice rug/blankets that the ashram puts out. I tried to go to the 3 hour meditation yesterday afternoon. This one monk whom we’ve seen before was leading the meditation. He oozes with love and devotion when he chants tho I can’t say I had a deep meditation–I was outside on the portico with a few other women so I didn’t make a nuisance of myself nodding off on a regular basis. Finally had to give up and go back to bed. But today it feels more normal. We love living in an ashram!!!!!! Oh Susannah! Won’t You Cook For Me? 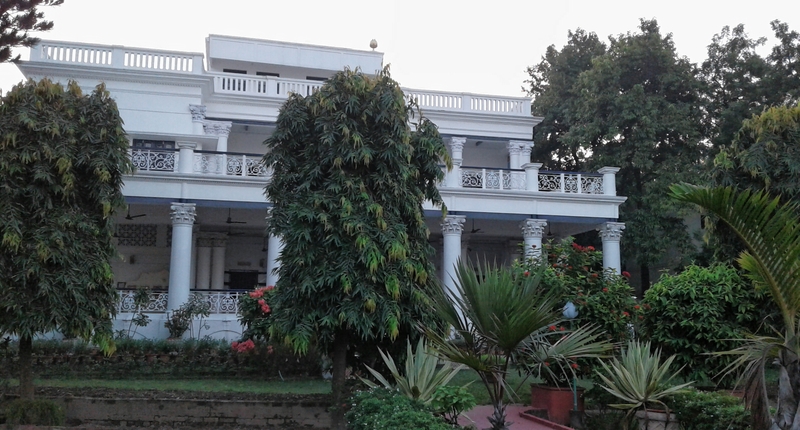 My husband, David, and I are the guests at the home/guesthouse of Mrs. Bhola Singh. 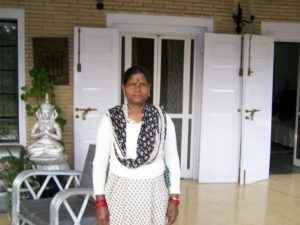 She is about 75 years old– a remarkable woman– independent and deeply devotional– a long time member of the Yogoda Satsanga Society here in Ranchi. Under the direction of Indira Gandhi in the late 50’s, she brought a group of young Indian dancers to the United States on a cultural exchange. “In those days we had to prove to the world that not everyone in India was a snake charmer,” she told me. Her husband passed away ten years ago, and her loyal servants have been with her for 25 years. 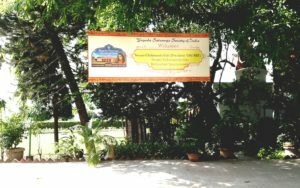 As a Westerner traveling in India, the concept of servants is difficult for me to accept though it is not my place, as a guest, to judge. 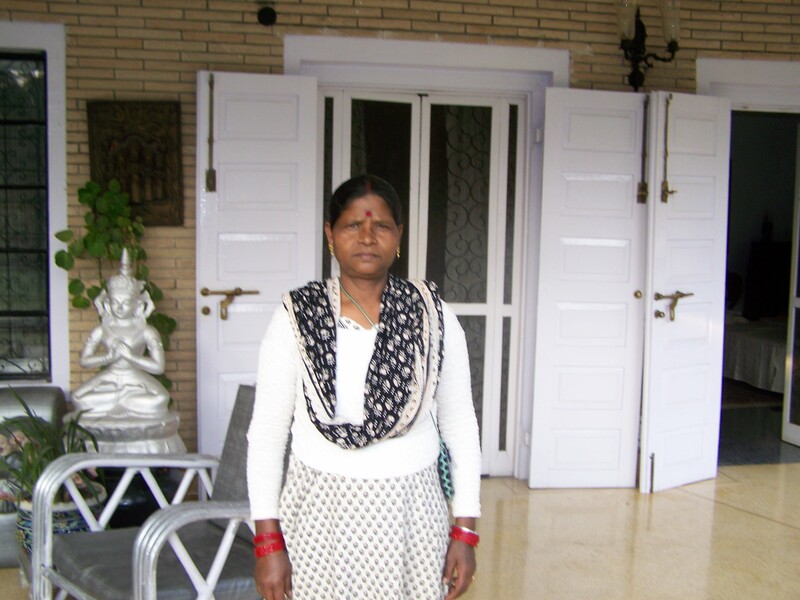 Susannah cooks and her husband, Kailash, manages the house and gardens. They live in a small cabin on this beautiful estate, eat well, and Mrs. Singh also pays for their teenage son’s education. The growing prosperity in India rarely reaches the lower classes. 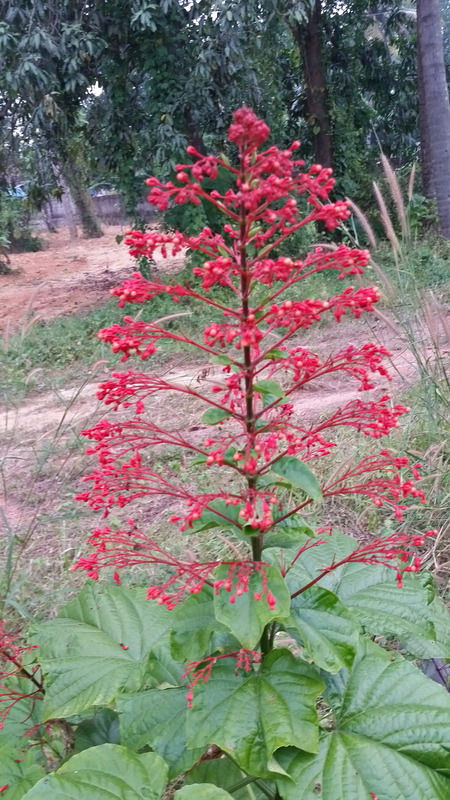 For most, life is harsh beyond our imaginations—in comparison Susannah and Kailash live well. Susannah explodes in embarrassed giggling. I sense that my friendliness crosses a few subtly drawn social lines, but we have fun together. (despite her serious attitude when it comes to taking a photo) Our attempts to understand each other begin and end with a great many “Thank yous!” One of the few words she knows in English and the only one I know in Hindi. I can’t say that we converse, but we definitely communicate. One evening I didn’t eat all the food she gave me. Her gestures asked why not, so I blew out my cheeks and walked like an elephant trying to show her how fat I’d become if I did. She laughed and laughed, but soon she walked to the table and asked sweetly, “Not good?” I reassured her with more pantomiming about how delicious the food was. I love this woman. Susanah teaches me more than just cooking. She sings quietly while she works and always smiles. She’s humble and does her work even when her employer or the guests are impatient, grouchy or just getting older and harder to please. She understands the concept of surrender/of the joy of serving others more than this independent, don’t tell me what to do American woman ever will. For 50 years, advertising in the West encouraged women to get out of the kitchen as fast as possible. Sometimes we see cooking as drudge work to avoid. Today in India, marketing is geared to the growing affluent generation of modern Indian women. It sounds exactly the same as what we and our mothers, in the 1950’s, were indoctrinated with. “Serve this pre-made soup in a box. It will make your children smarter and you will be a happy mother.” And the trend begins again. More profitable, packaged, processed foods for India. Susannah’s love and attention are physical ingredients in the food she prepares. That’s one of the things I admire about her. Serving others is her duty. She accepts that, and it actually makes her happy! What could be more important to do in life than to feed the ones we love? Dal is a standard dish in many regions of northern India usually served with rice, curries, and other vegetable dishes. It’s sort of the fried chicken of India. Every family/region prepares it differently. Susannah’s explanation to me for making dal went something like this. “Kshish! RRRR!! Kshish RRRR!” Four fingers shoot up in the air meaning the pressure cooker lets off steam and makes this sound four times before the dal is cooked. With knife in hand and pointing to the onions, garlic, and ginger; she says in English, “Cut, cut, cut, cut!” Circling the spoon in the air over the fry pan means sautéing them in the butter or ghee. I don’t have a pressure cooker so here is my Americanized version of how to make this delicious staple. Serve it with rice and raita which is a dish of yogurt with grated cucumbers and a dash of cumin and cayenne. In India dal is prepared in larger quantities to be used for several days, but this recipe is a smaller one for a first try. Enjoy! Add the rinsed split peas to the boiling water or stock. Cover and turn heat to simmer, about 30 minutes. Cook until tender but not so long that they lose their shape. They should have the texture of mashed potatoes. Heat oil in a medium size pan with a good lid. Add mustard seed to hot oil and cover. Allow to brown but not burn—just a couple minutes on a low flame. Open the lid very carefully as the seeds tend to jump like popcorn. Stir in turmeric, curry powder and garlic. Sauté until garlic is softened and then add the peas along with the lemon juice. Makes about 6 servings. *All of these ingredients can be purchased in bulk (in smaller quantities) at a natural foods store. Now that we are home from India and settled, I have more stories and pictures to share with you all. And I’d better get writing before the rains stop. Spring and the gardens will lure me away from writing. Many folks think we are out of our minds for returning to India again and again. But India isn’t about the mind, she tugs at my heart strings from 6000 miles away. We live in such a violent culture, and we project that onto other places in the world which are more peaceful than our own. I am always amazed at the amount of fear that people have about travel. Fear from our news media projects so much negativity, and we believe it. Of course, I’m not saying that one doesn’t need to have razor sharp discrimination when traveling but that’s true everywhere all the time. 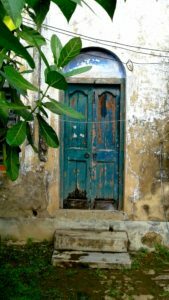 Not once, in any of our trips to India, was I ever in danger, not even when crammed into an antique Toyota van with seven women and two thin fleshed drivers careening around one lane roads in the Himalayas. I’ll never forget the door flying open every few miles. Without hardly noticing, the driver just pulled it closed again. Now that’s was a lesson in non-attachment. 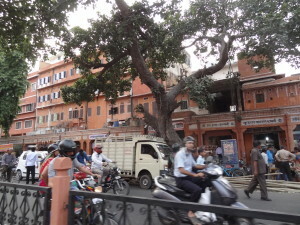 The greatest difficulty I experienced was that I often couldn’t remember who I was in my life when I was not in India. I was pleasantly disconnected from everything back home that I take for granted. There’s a certain freedom in travel that allows one to be more in the moment. In one of the last posts I mentioned my favorite Kolkata driver, Prodeep. I’ve known him since 2007 and watched him grow from a gangly young man into a father and a husband. One day he came to the Yogoda Satsanga Society ashram. 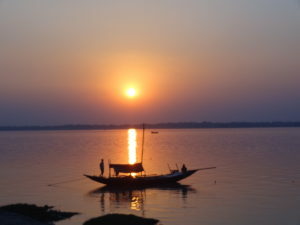 It’s located in Dakshineswar which used to be a village near Kolkata and is now what we might call a suburb. 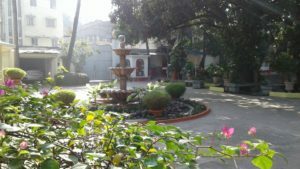 This is where one of our main ashrams are for the Yogoda Satsanga Society, the Indian division of Self Realization Fellowship. Our plan for the day was to drive to a computer shop and Mother Theresa’s house. I also wanted to visit the New Market. It’s underground in the center of Kolkata with rows of stalls of Indian art, silks, and crafts. 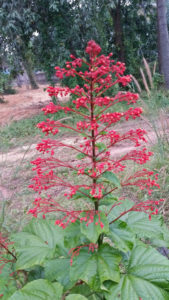 After all, Christmas was coming and why not buy treasures from India? David chose to stay in the car, but I convinced Prodeep to accompany me. In India, men and women don’t touch each other in public, but he was kind enough to let me hold his hand as we weaved our way through streets and crowds. And, I needed him to fight off the hawkers and touts at this market that are over-the-top aggressive especially when you’re a Western woman with shopping on her mind. A tout is a young man who gets a little kick back if he directs you to a particular stall or hotel or restaurant. I am proud of David, my 75 year old travel companion. At home he misplaces at least three things a week. But travel has made him much more mindful and better organized (and me too). For the most part, I no longer get upset when his hat, his gloves, his billfold seem to disappear for a few hours or days. We both love living out of a suitcase. Life is much simpler with fewer possessions to weigh you down. 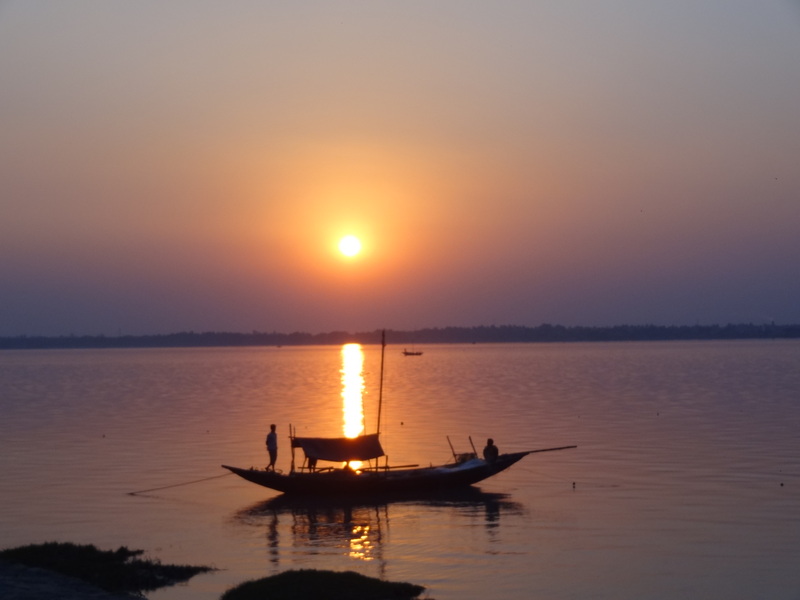 We drove back to the ATM counter in Dakshineswar, where we had stopped that morning. David was upset with himself. Sitting beside him was like being with a crazed cat in heat. Once we arrived, the two men emptied the waste basket and searched the entire ATM enclosure. I was still feeling a little disappointed in how the day was turning out. Fighting back the urge to be annoyed and impatient, I kept myself in the background allowing the two men to work this through. “My ATM card,” David answered somewhat sheepishly. “Blue.” Then, like a magic trick, he pulled out the card and handed it over. David overflowed with effusive gratitude. The whole family was laughing and breathing a sigh of relief. “Please, can I pay you something or give you something?” David pleaded, but the old man was a little taken aback by this. Watching the body language from my edge of the room, Prodeep shook his head at David to let him know it was not appropriate or necessary. “But you could buy one of our statues,” the old man said. The family gathered around to help Prodeep and David choose several four-inch sandstone statues, then paid for them as everyone waved goodbye. Another day of adventure and surprises. Time and time again we found the people of India, of course not all, full of integrity, willing to help, and always ready with a light hearted laugh at life. On American highways we have signs that tell us when to stop, to go,to merge, to beware of a curve ahead, and how fast is acceptable. It’s all safely determined ahead of time. Everyone knows the rules and most of us follow them. There are no pedestrians in or near our roads—in fact, walking as a mode of transportation as opposed to pleasure, is generally an antiquated idea. 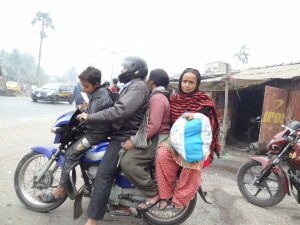 Everywhere one goes in India, at least in the cities, there is a tsunami of humanity on the roadways. People, cars, trucks, cows, dogs, oxcarts, motorcycles, bicycle rickshaws, tuk tuks (motorcycle taxis), school children and occasionally a camel all share the road. Each has as much of an equal right to the road as the other does or so it seems. There is a kind of logic to their system of traffic though perhaps the word “system” isn’t the right choice nor is the word “logic”. Finally, as I have overcome my shock and fear and, as yet, havent had an apoplexy, I realize there’s a certain choreography to the whole drama. Drivers in India seem to have more of a sense of the whole. Everything in front of them is theirs to dodge or otherwise not collide with. What goes on behind them is the other guy’s job to figure out. In and out of traffic, darting around trucks three times our size, forty miles an hour when there is enough space to speed and then a precise stop missing the tuk tuk in front of us by an inch. Pass on the right, pass on the left, or squeeze between the cow and the taxi. Pedestrians walk within inches of moving vehicles and step aside for them as if doing a do si do. 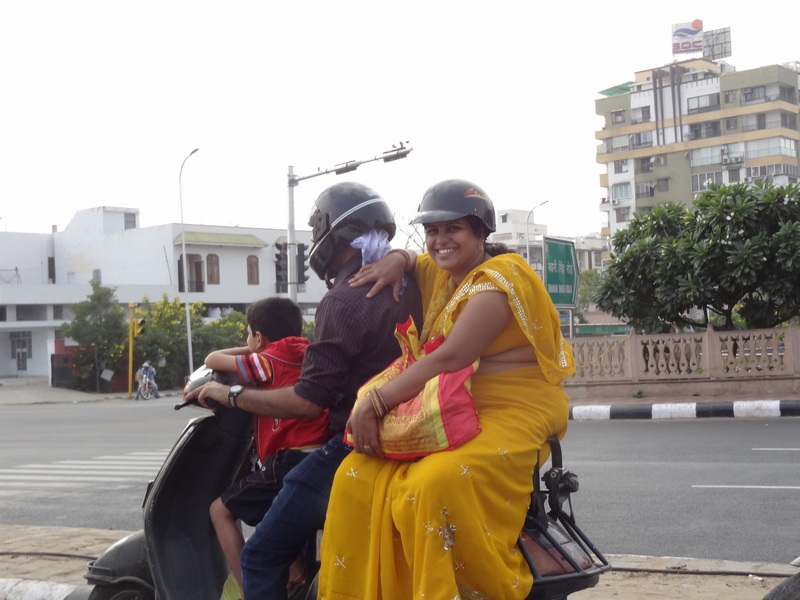 A young man on a motorcycle stops next to us. He holds a toddler between his knees. His beautiful wife in a radiantly colored sari sits side saddle and with one hand holds her infant child. “Courage!” It’s the word that stands out in my brain like bold lettering in a BIG font. As if all this isn’t enough, it’s an orchestra at fortissimo. Trucks grinding, engines burping and groaning. All manner of horns constantly blaring from beeps to elephant wails to deep duck drones. Pollution? Well, that’s another story. I’ve changed my attitude over the years. I’m not scared any more. It has become quite the entertainment. I feel so much admiration for these drivers . It’s a good profession here in India. They have incredible reflexes and seem to be able to see 180 degrees. Yesterday was our first day to leave the ashram and explore around Kolkata. Our favorite driver, Prodeep, has eyes that are like melted milk chocolate and full of compassion. He has enough “Hindlish” (English words) to get the message across most of the time and is diligent about repeating until we both understand where we need to go and when. I tell him that he and all the brave Kolkata drivers are reincarnations of the warriors of the Baghavad Gita, India’s great epic poem. He smiles and beams with pride. In reality, he owns a mid-size Honda and can, for bigger groups, borrow his brother’s SUV.